Not too long ago I was complaining about how my family is completely leftover-averse, even when I package some leftover turkey into a delicious turkey pot pie. Everyone but me looks at “best by” and “sell by” dates as if they are ironclad expiration dates instead of gentle suggestions which are designed to cover food manufacturers’ asses. I’m sure some of you have this issue with leftovers, too. Recently I shared a funny post from The Mid in which the vacationing mom is trying to get her kids to eat a leftover special sandwich of one piece of ham and copious amounts of ketchup. We’re just trying to be thrifty, man. Although I do think I might have a tendency toward an almost pathological denial of food spoilage. My sister was just telling me about the time she’d gotten violently ill after eating some bad cheese. “Sure, it was unpasteurized and pretty old and it smelled bad, but cheese is supposed to smell bad. And it was delicious!” I nodded sympathetically. This, you see, is how we were raised. But I’m fighting a losing battle at my house. The leftover hot dogs had been ignored in our refrigerator a very long time. I’d suggested them as lunch any number of times, and there was no enthusiasm whatsoever. Sure, the date had passed and there were none of those nitrates or nitrites to make them last into the next century, but they seemed like they were okay to me. In retrospect, I think I could have just started cooking them. Rarely do I think, “I’d really love a hot dog!” but it’s rarer still for me to actually smell a cooking hot dog and not at least want them a little bit. 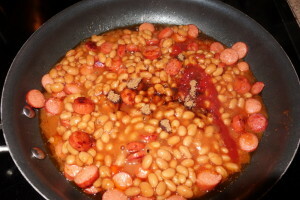 Here my strategy was to prepare beanie-weenies as if for myself, then reluctantly share them. Both girls came running, and they left about a tablespoon for my lunch. Nice job, me! At our house, my kids will go through phases of eating a ton of something and then, without warning and usually after I’ve just purchased an industrial supply, they’ll lose interest. 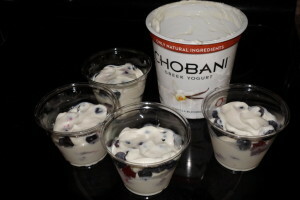 That’s what happened when I was left with a giant Chobani vanilla yogurt that had been lingering in my refrigerator for weeks. I’d mention it and the girls acted interested. . . for later sometime. Then more time passed and the date scared them. Smelled fine to me! I scooped some out into cups, along with some fruit, then popped them into the freezer. The next day M said, “Mom, these are so good, I love you so much!” I feel like roughly 66% of the I love yous that I receive are directly related to food. I try not to get bitter about it. But this time I wasn’t bitter at all, because I was thinking to myself, “That’s the old yogurt you refused to touch, suckah!” Not just that, but you know where the fruit came from, right? It’s the last blueberries and strawberries from the bottom of the bowl that were considered too unsightly for consumption. I pop those in the freezer and suddenly they’re worthy again. So, double-ha, suckers! I just finished your National Parks article. Well done. Here’s an idea that you might want to pass on: The Golden Ager Passport. If you happen to be travelling with, say, your parents or your maiden aunt who’s 62 years of age or older Have them buy a Golden Age Passport which will gain them and anyone else in the car in which they’re travelling free admission (and parking) in any National Park. I bought one for about $20 fifteen years ago and have used it as recently as a few months ago at Fort Pulaski in Savannah. Now those are some recipes to add to the Szlasa Family Cook Book.! Oh, that’s great! Even though I saw the Senior Pass, it hadn’t occurred to me that it meant that anyone with the senior would get in, too. I added it to the article–thanks. I read this eating last night’s left over salad for lunch. So what if the lettuce had lost its crunch? That IS how we roll.